For our team at The Windham Eagle, Wednesdays are publication days and making plans on a Wednesday night is a bold move. Our staff often stays late to make sure all parts of the paper come together. However, last week I was on a mission to leave by 5 p.m. to meet my roommate and our boyfriends for dinner in Westbrook. To make such a plan was risky, on my part, but I was really craving wings - and nothing gets in between me and a wing night with friends. All went smoothly, and I was able to leave early. On my way home, I took my usual route and followed Pope Road. Just after the well-known sharp curve on Pope Road, I noticed two cars slowing down on the opposite side of the road. Before I knew it, I saw a white dog run across the road with a retractable leash attached, dragging behind it. After the dog passed us, I continued forward a little to find a place to turn around and see if I was able to help. I was expecting the others who slowed down for the “getaway dog” would have pulled over to help the dog as well. Neither did stop, so I was on my own. When I pulled up to the house where the dog ran towards, I could see it had gotten caught on the porch by its leash. The house owner had already noticed the cars slowing down by his house and greeted me at their deck. Together, we decided that taking the lost dog to the Windham Police Department would be the best plan. I delivered the dog to the station and Officer Brokos took it from there – taking the happy-go-lucky pup to the Animal Refuge League in Westbrook. He was reunited with his owners shortly after that. Although I was on my way to meet friends and very excited about my evening plans, there was something about taking time to help that dog. I wouldn’t have been able to enjoy my dinner date if I hadn’t. In fact, I had called my boyfriend to tell him that we might be adopting a dog if the owner wasn’t found. Clearly, it doesn’t take much for me to get attached. I knew that if I had accidentally lost control of my dog that I would appreciate another person’s help. The fact is that giving, even when you know you will not receive anything in return, is very rewarding. Not just this holiday season, but in everyday life, I will continue to challenge myself and invite you to join me - to go out of your way to help others. I guarantee you will not regret how rewarding it feels to make a difference in a dog’s life. After all, dogs matter, too. 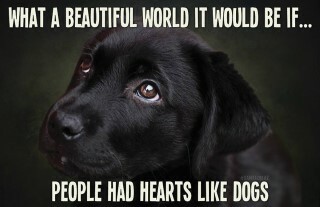 Especially to their owners.